As with many figures of popular culture, that of the March of Progress is well known while at the same time being obscure. In Wonderful Life (1989), renowned palaeontologist Stephen Jay Gould dwells upon this icon, which a Dutch editor had the ill-conceived idea of using as the cover image of a translation of one of his works. According to Gould, « Life is a copiously branching bush […], not a ladder of predictable progress »1. However, acknowledges Gould, the series of hominids in Indian file, known throughout the world, is actually the « canonical representation of evolution – the one picture immediately grasped and viscerally understood by all ». Few scientists, he explains, would acknowledge images as being « intrinsically ideological in content. […] But many of our pictures are incarnations of concepts masquerading as neutral descriptions of nature » – like this drawing, which invariably crowns the evolutionary process with a representation of a Caucasian male, conforming to racial and sexual stereotypes. Unlike the manner in which the palaeontologist habitually gives numerous references, this image is repeatedly used without quoting its source. Commenting on its variants, Gould refers to it as to a familiar iconography, a widespread image supposed to be perfectly understandable. Custom readily dictates the use of the term “icon” for renowned images disseminated by the cultural industries. The process of iconization could help render an ordinary production a status similar to of a work of art, complete with author and provenance, but it could equally give this status to images devoid of these traditional attributes, specifically identified by the repetition of a motif. The absence of source information in the case of the line of hominids is not so much a failure to attribute as the traces of its particular reception. Two rationales clash. The rationale of patrimony and art, which asserts that preservation of source information is integral to the creation of an art market2, where the value of an asset is determined by the mastery of historical knowledge, through the distinction of aristocratic lineage. Within the rationale of industry, which tries to lessen obstacles to dissemination, the mark of provenance is only rarely a factor in the valorization of a product. It will be therefore omitted or minimized (even in cases where there is a legal obligation, an editor can find ways to restrict acknowledgements). A situation which easily leads to the loss of source information, particularly during later adaptations. Suppression of auctorial rights or multiple reproductions contribute to the autonomisation of an icon. 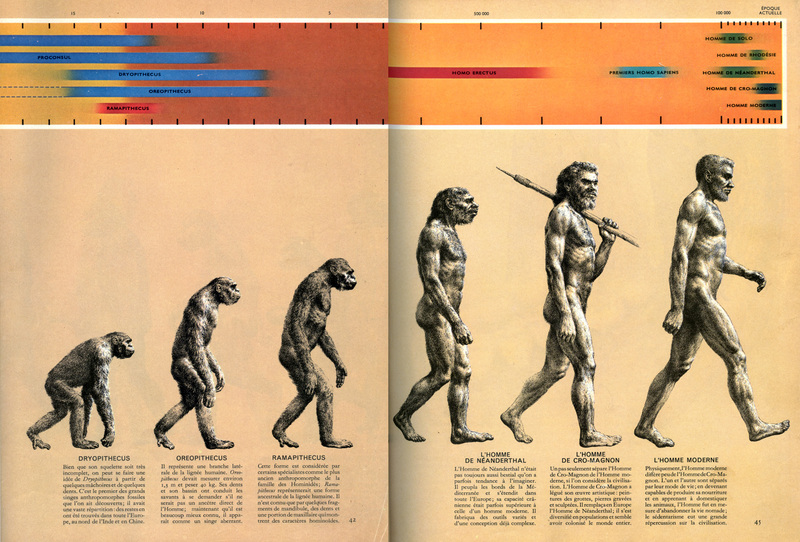 Rudolph Zallinger, Sur la voie d’Homo sapiens, 1965 (foldout section). The origin of the illustration confirms this last status. Drawn by Rudolph Zallinger (1919-1995) for the work by Francis Clark Howell (1925-2007), Early Man, published in 19653, this image takes place in the most ambitious work designed to popularise science ever published: that of Time-Life magazine, which spread across 51 volumes between 1961 and 1967 (with series including “Young Readers Nature Library” and “Life Science Library”). Translated in many countries, this series follows the long tradition inaugurated by Les Merveilles de la Science (The Marvels of Science) by Louis Figuier (1867), which associates the narrative of “useful knowledge”, necessary to instruct young minds, to an abundant illustration. Life-Time series is characterised by the quality of its writing, commissionned to specialists, but also by the unprecedented care of its iconography. Inspired by the principles which animated Life magazine, the series is the first work of scientific vulgarisation to push the importance of the image to such a degree. The editors sought to offer high quality illustration, mainly in colour, of an impeccable nature, by turning to the best artists and photographers. The iconography is often spectacular. It encompasses a large variety of styles and testifies the editors’ constant preoccupation with pedagogy. The image had to furnish a clear and comprehensible summary of condensed data. The series established an advanced expertise in terms of narrative schemes, combining the presentation of scientific data tables with a strong visual environment. Rudolph Zallinger’s contribution provided a particularly successful example of this genre. Prehistoric anthropology specialist, professor at the University of Chicago, Francis Clark Howell is also a confirmed advocate for the dissemination of knowledge. He consciously approached one of the most famous illustrators of natural science, creator of “The Age of Reptiles” mural at Yale University, completed between 1943 and 1947 – a panorama of the chronological evolution of dinosaurs in the Devonian and Cretaceous periods, measuring 33.5m by 4.9m. The 1965 creation was inspired by the previous work at Yale. On a foldout section of five pages – the largest illustration in the series – it laid out the ordered sequence of reconstructed fossils of 15 species of anthropoids over a period of 25 million years. The timeline at the top of the page is the work of George V. Kelvin. 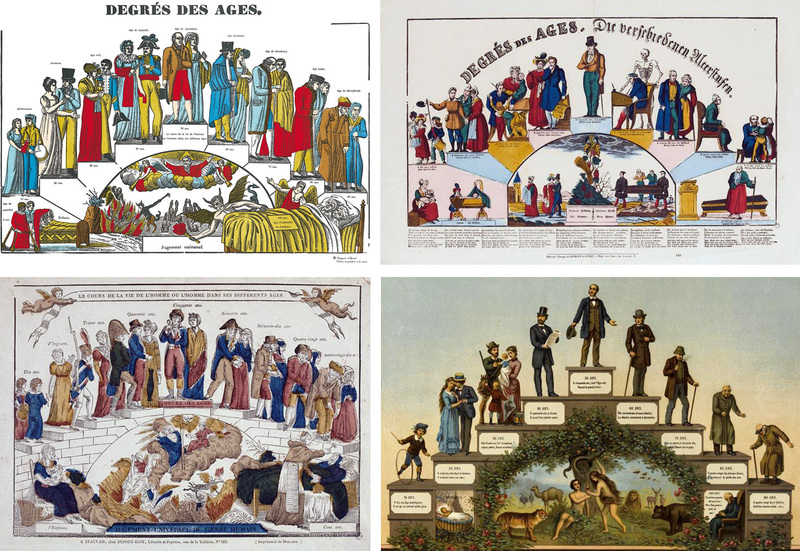 Under the heading “The Road to Homo Sapiens”, Zallinger’s pictorial synopsis is innovative compared to existing forms of evolutionary diagrams, usually arranged in tabular form. His offering could be likened to an etching by naturalist painter Waterhouse Hawkins, published as the frontispiece to Thomas Henry Huxley’s work, Evidence as to Man’s Place in Nature (1863), which, for comparative purposes, brought together the skeletons of the gibbon, orang-utan, chimpanzee, gorilla and human. « Man descended from apes ». The infamous comments of the Bishop of Oxford on the matter symbolises the polemic which followed the publication of The Origin of Species in 1859, creating a scandal with its anthropological reinterpretation of man’s destiny. 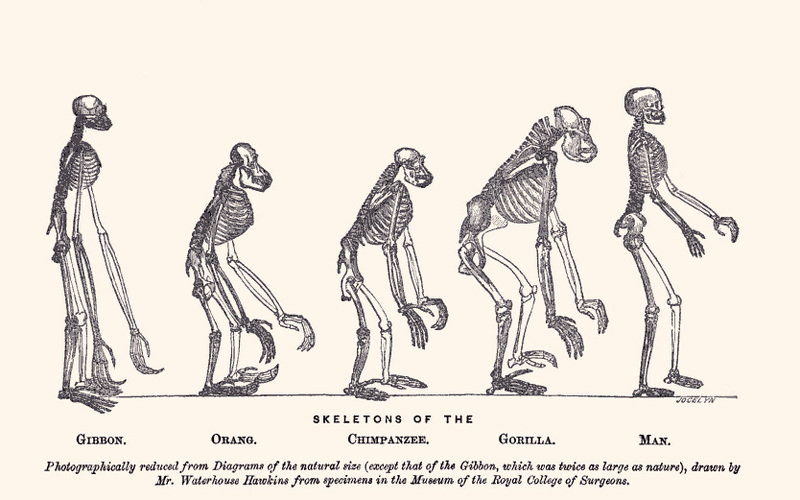 A supporter of Darwin, Thomas Huxley used Hawkins’ creation within the body of work aimed at demonstrating the zoological and anatomical proximity between the differing hominoid species. Although it was not paleontological in nature, this illustration which likens human to ape, truly merits it place in the history of the evolutionary debate. But this comparative exercise offered nothing more than a simple juxtaposition. To find a similar dynamic view to that of Zallinger, we must turn to the theme of the varying ages of man, which has influenced painting and printing since the Renaissance. One version on this theme, exemplified since the 16th century, became notably popularized by François Georgin, in 1826, for the Imagerie d’Epinal, entitled “Degrés des âges” (commonly known as the “Stages of Life” in English). This image horizontally sets out the motif in steps, facilitating the process of comparison. A popular print for the entire 19th century, it has been the subject of innumerable reproductions throughout Europe4. Is this similarity sufficient to designate this image as a source, in an iconographical sense, for Zallinger’s drawing? This is the hypothesis that I supported in an initial study of the work. However the similarity of form is deceptive. To see this, we must analyse the motif more exactly. To understand the interpretation of this icon, Stephen Jay Gould set about examining its variants. Many adaptations, which parody the image, feature a modification of the final figure in the group, signifying regression rather than progress. This manipulation of the narrative logic demonstrates that its fundamental meaning is perceived as a historic sequence with a strict orientation, a gradual and irreversible improvement, which effectively corresponds to the popular interpretation of the evolution of the species. 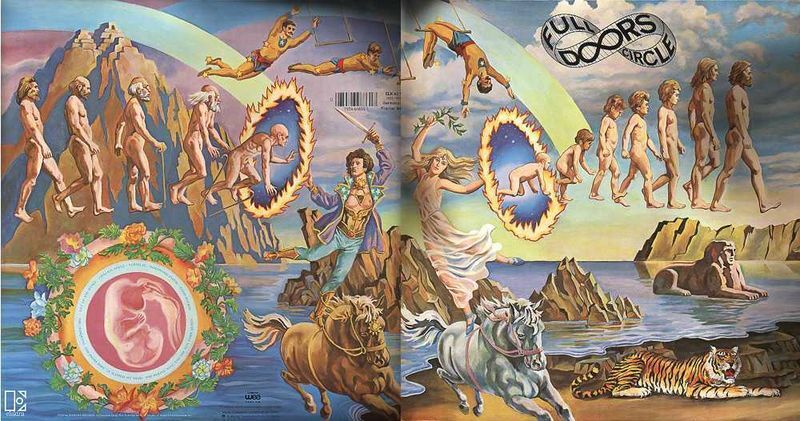 This is not the significance assigned to the image of the Stages of Life, which describes the passage from growth to decline in cyclical logic, well illustrated on the album cover of the Doors’ Full Circle (1972). Wikipedia suggests the cover should be considered as an adaptation of Zallinger’s image, and it is likely that Ernie Cefalu’s composition was so inspired (notably the change from walking on all fours to standing). However, despite the proximity in their form, the two images relate to two clearly distinct narrative concepts. Putting the Stages of Life into a series illustrates a tale of metamorphosis: with each new stage the same individual transforms. It does not imply improvement to be crowned in the final stage. Conversely, the March of Progress relates a teleological scenario where the personae are representatives of different species, each doted with new qualities further resembling the current stage, understood as being an unsurpassable state of perfection. In the narrative logic of the March of Progress, Neanderthal man does not transform into Homo Sapiens: he disappears and cedes his place. This observation leads to several further findings. First, we must admit that, with iconic data such as that linked to the people in Indian file, lateral adaptation and change in dynamic aspect are not suffice to deduce the significance of the figures. Their metamorphic or evolutionary interpretation rests on the nature of the bond which ties the different links in the chain. In other words, even such a synthetic composition – an image elaborated to convey an immediate message – cannot be understood outside of a preexisting story, traditionally associated with the image. It is the awareness of the story which allows correct interpretation of the sequence, including those variants lacking reference information, where the knowledge necessary to form an understanding is founded on a tacit recollection of the image. 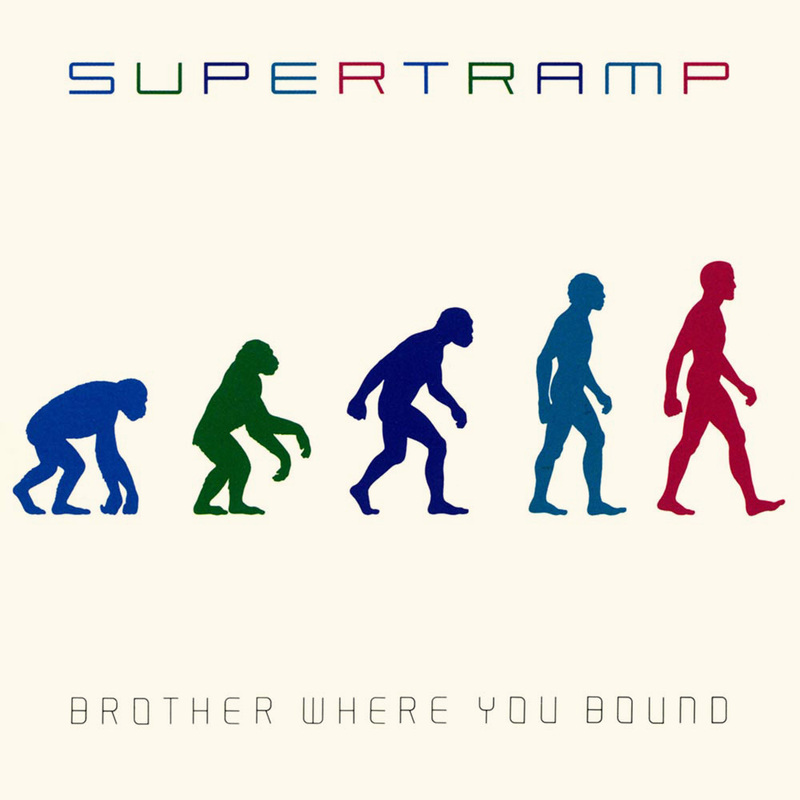 Supertramp, Brother Where You Bound, 1985 (design Norman Moore). The understanding which is traditionally associated with the image bears several differences to the original source. The legend to the illustration on the volume of Time-Life states that several depictions are broadly hypothetical, or that certain hominids have been drawn standing for ease of comparison, although they were quadrupeds. Equally, the timeline which heads the image indicates that certain lines are extinct, contradicting the idea of linearity of the series. The iconic image achieving autonomy has led to the loss of these details, reducing its significance to a theme of ineluctable progressive improvement, this being the most basic concept of Darwinian evolution. Rather than on the formal genealogy of the iconography, variants are founded on a knowledge base strictly tied in with the history of evolutionary theory, propagated by rumour. A culture of déjà-vu rather than reference, of allusion rather than quotation, this continual spread is sustained by repetition. Instead of proffering a design devoid of signification, open to interpretation, the icon appears as an image linked with the memory of a narrative framework which determines its comprehension. This comprehension is therefore less « visceral » than iterative. Contrary to the famous Magritte painting, which is not a pipe but the image of a pipe, the icon of the cultural industries is a story that does not tell its name. As Stephen Jay Gould strongly asserts, this very image functions as « the canonical representation of evolution ». The pedagogic drawing immediately relates a contextual narration, while concealing its elaborate dimension behind a veil of implied memories. Shortly, the image naturalizes the narrative. It presents a motive which incorporates a lesson, but does does not appear as a situated or signed enunciation. This is how it can subtly convey a message, even an ideology. This conversion is one of the essential functions of visual forms of mediaculture. Redaction of seminar of 11 February 2016. English translation by Adrian Jordan. Also read on this blog: “Reading images: Narrative imageries”, 21/07/2015. Pour qui le burkini est-il « ostentatoire »? Photographie, la fin du mythe?